Joining metals by one form or another of soft or hard soldering, or brazing with various alloys, are run-of-the-mill jobs in model and light engineering workshops - so much so that little thought is given as to whether there might be a quicker, more efficient or less expensive means of achieving the required end. 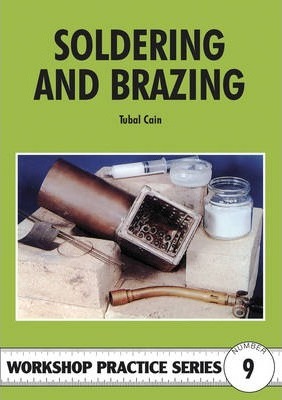 In Soldering and Brazing respected engineering writer Tubal Cain examines in detail the processes, equipment and materials, and explains what is happening in the joints as they are made with practical examples, test pieces, tabulated data etc. This is a thorough, comprehensive and, above all, useful book. The Characteristics of Filler Metals. Soft Solders. Brazing Alloys. Fluxes. Soft Soldering Techniques. Tools for Soft Soldering. Brazing Techniques. Brazing Equipment. Capillary Joint Design. Safety Precautions. Properties of Brazing Alloys. Data on Fuel Gases. Hazards Arising From Cadmium-Bearing Alloys.